Arduino Driver can I use only PNP? is it possible to use a normal PNP transistor to drive a motor? I'm kinda new to this stuff so I want to be on the safe side, so I don't damage my Arduino Uno because of the motor. I have made a motor driver? https://circuits.io/circuits/2493784-test-1 But I'm not sure if i have done right and I wont break any components. So does this work without any problems and have I done it right? I'm not trying to make a H-bridge because I need both PNP and NPN? When connecting together several circuits that have different supply voltages, common practice is to make them all have a common negative supply rail. This is called “common ground”. As explained in Majenko’s answer, you would need an NPN transistor for that. If you want to use a PNP instead, then you could forget the common practice and do everything “backwads”: if you connect together the positive ends of the power supplies, you will have a “common VCC” instead of a common ground. 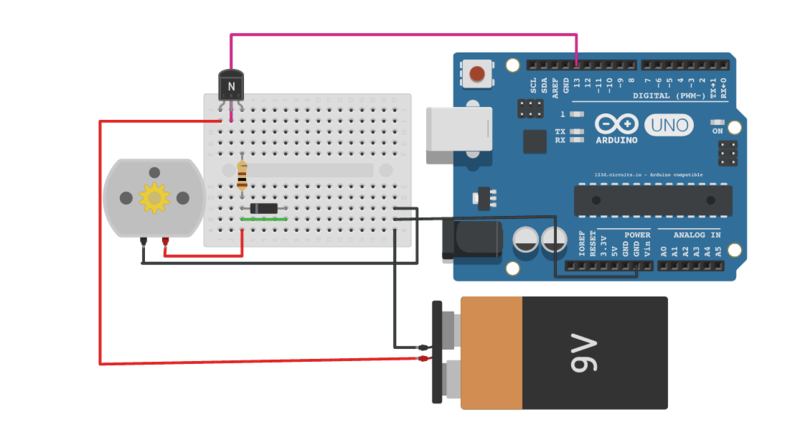 Relative to the Arduino ground, your 9 V battery will have one pole at +5 V and the other at −4 V.
put a free wheeling diode in parallel with the motor. Edit: Below is an ASCII art rendering of the circuit. Beware that the motor is ON when the Arduino output is LOW. |         |        ___ 9 V batt. Using an NPN transistor is the way to go here. Keep in mind that you can't control the direction of a motor with just one transistor, however. Despite the fact that the circuit you have is completely wrong, there is one fundamental thing that is stopping you using a PNP transistor. With an NPN transistor you have to raise the voltage on the base above the ground voltage (this voltage is called V_BE, the Voltage between Base and Emitter). Typically that voltage is around 0.7V. With an PNP, because the emitter is wired to your 9V rail, V_BE must therefore be relative to 9V, not ground, so the voltage on the base must be less than 0.7V below 9V to turn on. Which in itself is fine - a LOW will be around 0V, which is about 9V less than 9V. So it will turn on. The problem comes when you want to turn it off. You need to get the base voltage above 8.3V (9V - 0.7V), and that is impossible for an Arduino to do. So normally a PNP transistor is switched by using an NPN transistor to switch the base of the PNP between 9V (pulled up through a resistor) and 0V (switched through the NPN). And that then becomes pretty much pointless, since you are then adding a second, NPN, transistor, and you could just as well use the NPN alone to switch the motor, making the PNP completely redundant. I don't know what you are trying to do, because the link fails to display in my browser. In general there is no reason why you can not use a PNP transistor, providing you use appropriate polarities, and assuming common-emitter mode, reference to the +5V rail rather than Gnd. Having said that, you would need some specific reason. In general NPN devices are cheaper and/or outperform PNP, all other things being equal. How to test the sleep / enable function of Stepper Driver? Is Roboteq motor driver compatible with Arduino? How to connect this motor driver board to Arduino to drive bidirectional motor?